The Ameyal Hotel & Family Suites is a small and comfortable hotel that offers excellent standards of quality and hospitality in a quiet and cozy environment for business and leisure trips. The location of El Ameyal Hotel & Family Suites in Cabo San Lucas is really excellent, very close to the marina, downtown and beaches but with that element of privacy that we know will be to your liking. It will be a pleasure for our guest service department to suggest and help you coordinate appropriate activities for your family trip in Los Cabos. Meet a new way of taking care of yourself while enjoying first class accommodation in the exclusive Cabo San Lucas, Baja California Sur, Mexico. The Ameyal Hotel & Family Suites offers in its facilities an innovative and refreshing blend of health, well-being and comfort, with services focused on restoring and renewing the balance of your body, mind and spirit. 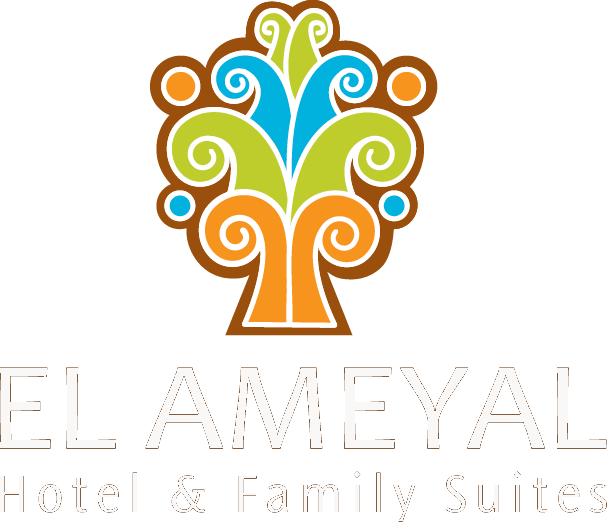 Stay in one of the 26 comfortable rooms at El Ameyal Hotel & Family Suites. Divided into Standard rooms and Suites all overlooking the pleasant garden and pool area. The Suites with one and two beds can accommodate up to six people including dining room, living area, sofa bed, multiple closets and large equipped kitchenette and own balcony, ideal for families and long stays.The standard rooms have a minibar, TV and a small kitchen bar. It is a space integrated by a wide list of elements (including the only Temazcal of Cabo San Lucas ) focused on improving and prolonging your health in a completely natural way. The SPA of El Ameyal Hotel has professional staff that employs from ancestral knowledge to modern Western techniques in each of the treatments we offer. If there is something to celebrate, why not celebrate it big? Book your event at El Ameyal Hotel & Family Suites. Learn more about Cabo San Lucas, a splendid world-class port.